The McLaughlin Bay Wildlife Reserve, located behind GM Canada headquarters building, is open to the public for the enjoyment of wildlife habitat and day use activities. Cross-country skiing, snowshoeing and skating are favorite pastimes during the winter, while cycling, walking/hiking, birdwatching and photography are more popular during the warmer months. One of the goals of the McLaughlin Bay Wildlife Reserve Master Plan was to create an area where people and wildlife could co-exist in harmony. With almost 7 km of walking and cycling trails, the McLaughlin Bay Wildlife Reserve provides not only access to the varied habitats to explore and vistas to enjoy, but also serve to link existing trails from Darlington Provincial Park and the Second Marsh Wildlife Area. 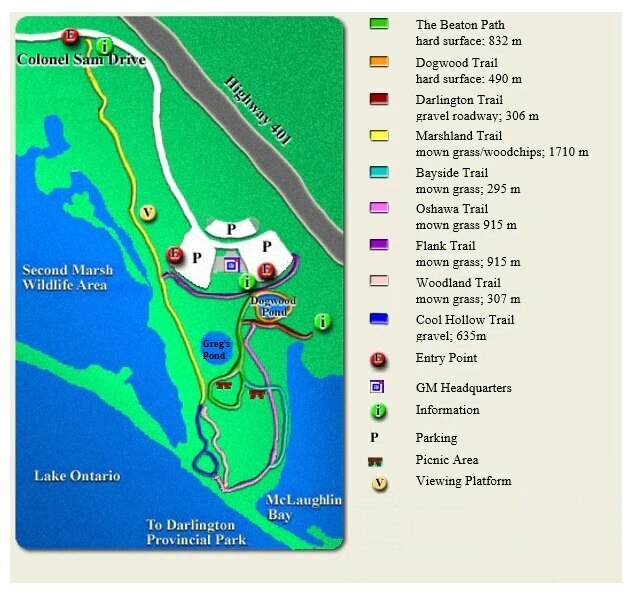 Trails within the Reserve are also linked to a strategic network of walkways which make up the Lake Ontario Waterfront Trail. The Waterfront Trail (spearheaded by Waterfront Regeneration Trust) will eventually link all of the waterfront communities from Niagara to Gananoque. The Dogwood trail at McLaughlin Bay Wildlife Reserve, designed in consultation with the Canadian National Institute for the Blind, provides an opportunity for partially-sighted or visually-impaired individuals to share in the delights of nature. A "multi-sensory" trail, suitable for anyone visiting the Reserve, it is a 490 m loop with hard, granular surface suitable as well for wheelchairs. It features a guide-rope, with panels in Braille and large-lettered text situated at strategic intervals along the route. Visitors are able to learn about the wildlife and natural history of the area using their senses of touch, smell and hearing. General Motors of Canada Company welcomes you to the McLaughlin Bay Wildlife Reserve (the “Reserve”). It is our pleasure to share with you the Reserve’s waterfront area and a wide variety of flora and fauna that reside on the property. We encourage you to invite others to visit the Reserve and only ask that you respect a few simple rules designed to increase everyone’s enjoyment of the property and to protect the resident wildlife. THE RESERVE IS NOT MAINTAINED IN WINTER. Surfaces may become icy and dangerous – USE AT YOUR OWN RISK. FOR YOUR SAFETY, AND FOR THE PROTECTION OF WILDLIFE, PLEASE STAY ON THE FOOTPATHS, BEACHES AND REST AREAS. THE TRAIL THROUGH THE MCLAUGHLIN BAY WILDLIFE RESERVE IS A RECREATIONAL TRAIL. Use of this trail and the Reserve IS AT YOUR OWN RISK. NO MOTORIZED VEHICLES OR DOGS PERMITTED. AREA IS RESTRICTED TO PEDESTRIAN TRAFFIC AND CYCLISTS ONLY. Cyclists must always allow pedestrians the right-of-way. FISHING with a valid license is allowed. Do not leave behind hooks or lines. SWIMMING AND ICE-SKATING is done AT YOUR OWN RISK. No lifeguard on duty or supervision provided. ICE THICKNESS IS NOT MONITORED. NO HUNTING OR FIREWORKS. Possession and use of all firearms or fireworks is strictly prohibited. NO FIRES. Fires are strictly prohibited. NO ALCHOHOL, MARIJUANA OR ILLICT DRUGS. NO LITTERING OR DUMPING. Place your garbage in the trash bins provided. NO CAMPING. No camping allowed on the Reserve. NO EXCESSIVE NOISE. Excessive noise is not permitted. NO VANDALISM. Destruction or removal of any objects from the Reserve is prohibited. NO FEEDING WILDLIFE INCLUDING SWANS, GULLS OR GEESE. NO VENDING, SOLICITING OR ADVERTISING. General Motors of Canada Company shall not be held responsible for lost, stolen or damaged articles either in the parking lots or while on the Reserve. General Motors of Canada Company shall not be responsible for any harm or damage to persons or property, occurring either in the parking lots or on the Reserve whether caused by the condition of the premises or by activity carried out on the premises.